Take a close look and tell me what is wrong with this picture. The door says "PULL", yet the handle bar is on the other side of the glass door. WUT? Why is there another door handle bar at the hinge side of the door? WUT? WUT? 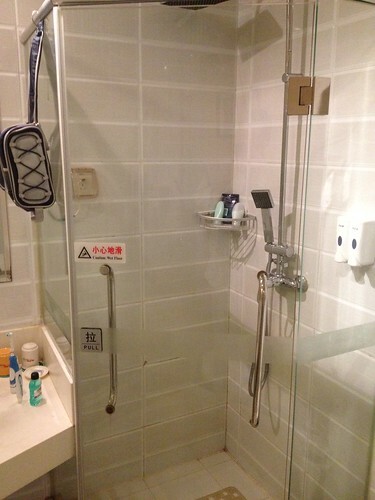 I was on a business trip to Shanghai early last week and was checked into this motel. I was truly baffled by the bathroom. Next, I decided to open the curtains to check out the view outside. I was treated to an awesome view of the ..... WALL. I asked for a quiet room and was given this one located next to the hotel's restaurant. As I checked in around 11pm, the restaurant closed for the day was dead quiet. Until 6am the next morning where I was rudely awakened by the clangs of the pots and woks as the kitchen sprung to life preparing breakfast for the guests. To make matters worse, oil fumes from the kitchen, presumably, next door starting filling my room! I went down to the front desk and demanded a change of room. The room for my subsequently nights was much better except for the fact that the shower cubicle door (also PULL/PUSH mix up), came right off when I pulled it. The whole bladdy door handled had rusted through. The consolation was the hot water was instantaneous as compared to my hotel back in the Capital. So. Would I still stay there the next time I am back in Shanghai? 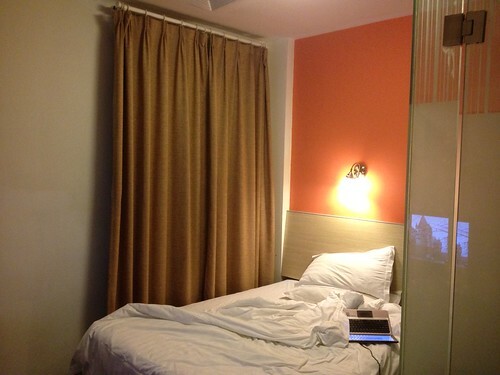 For RMB 177 (SGD 35.40) per night. 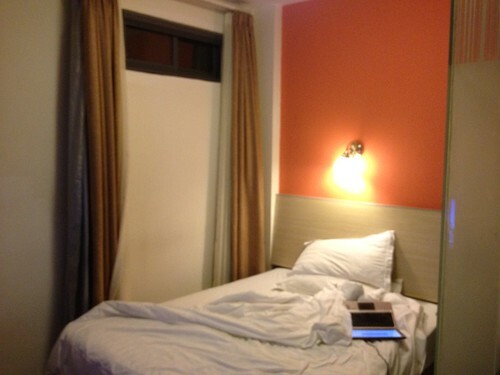 Arrenn: All rooms are RMB 177. My room just happened to be next to the in-house restaurant. The curtains/windows thing is just too funny! Ash: That's the story of my life. A walking tragic comedy. Always kena this type of pattern one. Le sigh.